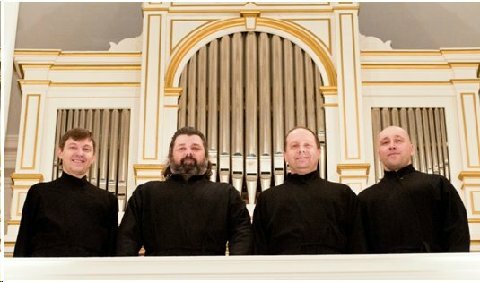 The Konevets Quartet, performing live at Holy Trinity on Sunday, November 17 at 7 p.m.
On Sunday, November 17 at 7 p.m., Holy Trinity Orthodox Church (119 S. Sparks St., in State College) will host an evening of beautiful and sacred music performed by the renowned Konevets Russian Quartet. The a cappella selections sung by the quartet include selections from 20th-century composers such as Chesnokov, Grechaninov, and Stravinsky, as well as ancient, centuries-old hymns in their original one-, two-, and three-part arrangements. Founded by graduates of the St. Petersburg Music Conservatory in 1992, the ensemble travels around the world with the goal of sharing the rich Russian vocal tradition with classical music enthusiasts and audiences from diverse faith traditions and backgrounds. 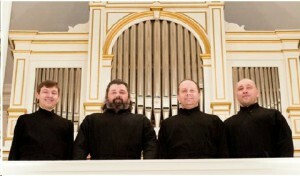 Holy Trinity is the first stop on the group’s 2013 Holiday U.S. Tour. The performance is free of charge and open to the public. A free-will offering will be accepted to support the Konevets Monastery (from which the group takes its name), a 600-year-old religious community located on Lake Ladoga, 100 miles northeast of St. Petersburg. A meet-and-greet reception with the quartet will follow the presentation, where CDs will be available for purchase.